Manufactured in a facility that also processes milk, eggs, fish, crustaceans, shellfish, tree nuts, peanuts, shrimp and sulphite products. Ingredients: Noodles: Wheat Flour, Palm Oil, Modified Potato Starch, Salt, Acidity Regulator (E500), Stabiliser (E412), Gluten, Emulsifiers (E420, E471, E322) (From Soy), Colouring (E101). Soup Base: Salt, Red Pepper Powder, Sugar, Flavour Enhancer (E621), Soy Sauce Powder (Water, Salt, Soybean, Acidity Regulator (E500)). Kimchi Powder: Cabbage, Sugar, Salt, Garlic, Red Pepper, Onion. Vegetable Flakes: Carrot, Black Pepper, Garlic, Green Onion, Cabbage. 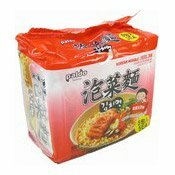 Simply enter your details below and we will send you an e-mail when “Kimchi Instant Noodles Multipack (韓國泡菜麵)” is back in stock!